Lure fishermen wishing to visit Fishing World in the Minburi district on the outskirts of Bangkok Thailand will be picked up by a Fishsiam representative and transported to Minburi by air-conditioned minibus.The transfer takes approx 30 minutes from Central Bangkok. On arrival at the gigantic six hundred acre windswept lake you will be transported to various areas of the lake in search of a variety of predatory fish. A trip to the onsite restaurant where they serve delicious food, will allow anglers a chance to view close up large Pacu and other predatory fish devouring any scraps thrown into the gin clear water. Half a dozen bungalows line one of the banks which can be hired on a daily or nightly basis. The remainder of the lake has low lying banks covered in lush grass and bushes. The majority of fishing in Minburi entails the use of our on site boat. Angler(s) visiting this venue will be equipped with all necessary lure fishing equipment in addition to lures / spoons etc. 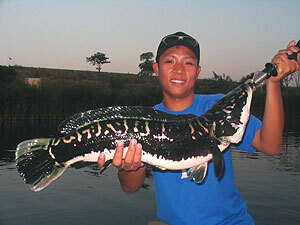 Using a variety of methods including freshwater jigging, trawling lures behind our boat and adopting a static approach casting lures from the boat the angler(s) will experience thrilling lure fishing action catching a wide selection of species including the highly aggressive Giant Snakehead and various Barb species. All lures / spoons and boat hire (with engine) are included in this package in addition to return transfers in Bangkok. The duration of our daily trips to this venue is 6-7 hours after which you will be returned to your hotel. 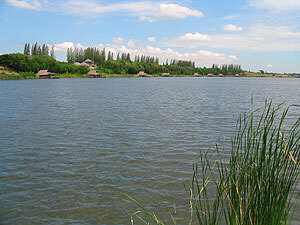 Fishsiam offers daily trips to this lake in addition to weekly packages with various options for accommodation. Trips to this venue can be combined in our tailor made packages which are designed to meet the visiting angler(s) specific angling requirements. Please note that we are currently unable to organise angling trips to this venue, which sadly is now a water sports centre making it impossible to fish from boats.